I'm loving Freedom @ Topshop's new tattoo-inspired jewellery range. I already posess this great 'Love' silver necklace and the rose-printed locket ring. 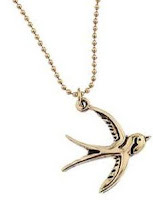 Next on my to-buy list is this cute swallow necklace. Now all that's needed is some hot new ink! I love that heart locket! Want!